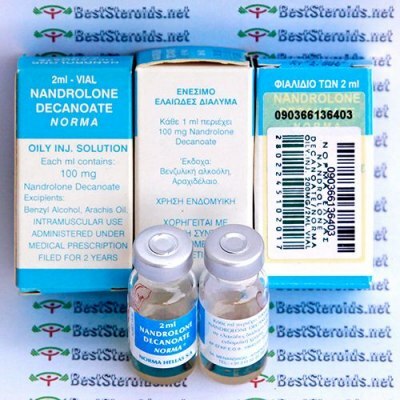 Nandrolone Decanoate is one of the most popular and common steroids used by athletes of all types. It is a low androgenic steroid which has high anabolic properties. It is not very toxic to the liver, and doesn't distrub the body's hormone functions to much. Nandrolone Decanoate can be used for muscle buildup or in preparation for a competition, and is excellent for developing size and strength. It has been stacked it with just about every steroid with positive results. This makes it a good base drug for any cycle. Nandrolone Decanoate exhibits significant anabolic effects with minimal androgenic side effects. Considered by many the best overall steroid for a man to use (side effects vs. results) Nandrolone Decanoate is most commonly injected once per week at a dosage of 300-500mg. With this amount, estrogen conversion is slight so gyno is usually not a problem. It takes three days after injection to dissolve from the site, and stays active in your body for about 17 days. Because of this your gains will go away very slowly after the cycle, as long as you continue to train. I am on week six of my deca injections and I can really see a huge increase in strength. the way my bench press is increasing just blows me away. I never thought in a million years I could increase my bench so quickly. the only side I think I am getting from it is water retention, however, as far as that goes it is minimal. I have used Deca numerous times with great results along side Test E absolutely zero pip.. this stuff helps me not only gain confidence and size but aids my joints. nice gains with huge pumps.. I think this is top of the line, i had good result. I couldnt imagine hitting the gym heavy like I do without this product. Pricy tho.